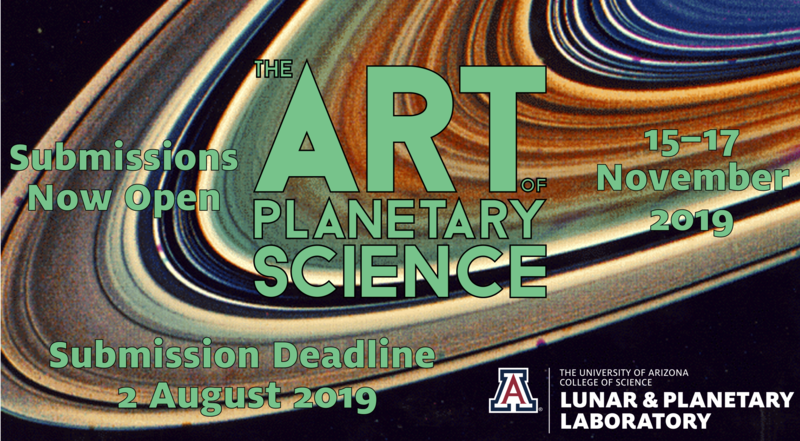 The Art of Planetary Science is an annual art exhibition run by UA's Lunar and Planetary Laboratory that celebrates the beauty and elegance of science, founded by graduate students in 2013 as a public outreach project to engage the local community in our work. Today, the annual exhibition and satellite events at scientific conferences are organized by volunteer students and scientists across multiple institutions to bring the art and science communities together to engage the public. The show presents a multi-faceted view of science and scientists, and we hope it can inspire in others the same passion it inspires in us. As scientists, it is our job to create knowledge, and like art this process requires thought, creativity, attention to detail, and imagination. Scientists are encouraged to produce artwork for the show that is created from scientific data, or incorporates scientific ideas, to give you new perspective on our work and the universe. We also ask artists to submit work that is inspired by those same themes, and to show us how they view science from their own lens. This event is a powerful way to bridge the gap between communities and show how very interconnected the scientific and artistic processes are. The past year we displayed over 200 pieces of art from almost 100 artists and scientists, and drew more than 700 guests! Participation in and attendance to this event is free! We encourage scientists and artists of all levels, from anywhere, to participate. All types of visual art are welcome, from paintings and photographs, to sculptures and glasswork, to poetry and film. If you'd like to submit artwork, sign up for our email list to make sure you get notified about next year's show! You can also watch our Facebook page, Twitter, and Instagram for event updates! If you are interested in organizing a similar event where you are, feel free to contact us and browse our conference presentations.